I take the utmost pleasure and honor in introducing myself to you, the readers of this remarkable weblog! 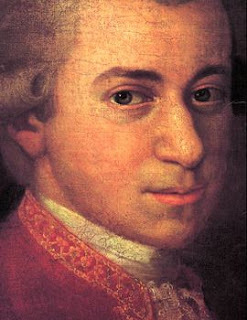 I have been, I will be, I most certainly shall be and I am your most humble and obedient servant in music, Wolfgang Amadè Mozart, and the mistress of this site has generously asked me to write a guest post, which, of course, I am all too happy to do. I regret that time and space do not permit me to reveal to you exactly how I came to be here in this perplexing and fantastical world of the Internet, but here I am nevertheless. If you are curious, you can read that on my own weblog, Prima La Musica (http://mozartmagnus.blogspot.com/). I will say that however it is accomplished, I am delighted, for it provides me excellent opportunities to get to know future generations of music lovers, and musicians. How music has changed through the centuries! And yet it has not changed in its ability to please, inspire and incite. The language may change, but the sentiments do not. That my own work has reached the fame it has fills me with no small amazement. I suppose my father was right all along and it is to him, as well as my wife and her second husband, that I owe gratitude. But enough of all that. I found History Undressed one night as I sat up combing the Internet for new sites to read, and I am happy to say that it was the very first I chanced upon. The title alone was enough to pique my curiosity! Through this site I found others that are dedicated to history and I have made a number of new friends. If you know anything about me at all, you know that I am, after all, a genial man and that I fairly thrive on the society of other people. Through the years I have been asked many interesting and thought-provoking questions by visitors to my site, which caused me to create a feature which I call, Ask Mozart. The question that seems to be asked most is, what do I think of modern music. Because my experience of your century is limited to that which I can see and hear via this Magic Box that was lent to me, I can only say that I am most impressed with the growing number of styles, and styles within each style. I do not know how you keep up with it all! If I were a living composer in your time I would be hard-pressed to do so; I believe that I would have to simply ignore those that I do not like and listen only to those that I do. Now, because there are so many styles, genres and forms, I perceive that much of your modern music is, more or less, little more than branches from particular trees, the largest of which is simple folk music, a style that I use in my own music. But a discourse in music history is not what our charming and affable Hostess wants of me, so I shall leave that topic. Wunderbar, wunderbar! I'm so glad you were able to visit with us, Wolfgang. Can you tell us your most complex piece and why? Dear Lady in the lovely crimson frock: Thank you. It was a great pleasure! The first subject in the Finale movement of what is in your century called my "Jupiter" symphony, consists of two short themes, the first which I took from a Gregorian chant. The second is more vigorous and proceeds along in imitation, consisting of two short themes. The first, which is assigned to the violins, is combined with a descending scale and a six-note figure given to the woodwinds. A further four-note motif from the oboes leads to the development. In the development section, I worked at the five themes of the exposition polyphonically and with a series of canons, all of which add a turbulence to the music as it proceeds, but which begins to settle as the recapitulation approaches. The recapitulation opens with a full statement of the movement's opening subject, which opens out into a series of chromatic sequences, until the movement is brought under control in the coda through my use of counterpoint and of orchestration. Fabulous, Wolfgang! So happy you were able to post! I am curious about your death...was there foul play? I love a good conspiracy theory. Mein Tod! Himmel! Although I certainly am curious about it, I think that to know the hows and wherefores would be most unsettling. I did ask a trusted modern friend to give me the minutest detail, because everyone in your century seems to be so consumed with it, and he informed me that it will be brought about by illness and nothing else. To say that I was relieved to hear this is an understatement, for I have received numerous letters from people asking if I was poisoned, and by a most unlikely set of characters, not the least of which is my own dear little wife! Gossip, gossip, all is gossip. Thank you for your kind and generous words, dear lady. Moreover, I have decided that I do not like my previous profile likeness and I have changed it to this one. Thank you all so much for the many comments and questions for our famous new friend! And Mozart thank you from the bottom of my heart you are a fabulous host! And I LOVE your new profile pic! Much better profile pic. The other one looked like a dead squirrel. I am deeply honored to have your esteemed presence grace my humble little Willow Manor! Would you do me the favor of this dance? We have SO much to talk about! Oh, listen they're playing "Non so piu"!! Mr. Mozart, could you please speak with that vile violinist, before Sir Anthony Hopkins decides to make him into some kind of strange ragu? I am so pleased that you are enjoying the Ball! Ach, mein Kopf... What a party it was! You grew up in a musical family, do you think if this hadn't been the case you would still have found your talent? I've often wondered if people are born with talent and then nuture it to become artists, or if you can be born without it and through discipline become and artist.